In the engineering business, it’s common to be asked for time series forecasts. Production forecasts, man-hour forecasts, sales forecasts, the list is endless. In those cases where the only available information is the time series itself, the “go to” forecasting method is commonly a “Black Box”, or some form of the ARIMA (autoregressive integrated moving average) technique. These techniques do a good job of torturing usable patterns out of the original data, however they don’t provide insights into why the patterns exist. If additional information is available, it can be worthwhile to explore its use in the forecast. An underlying real world model structure can not only improve the forecast, but can boost the user’s confidence in the results. In the following example, the Electric Reliability Council of Texas (ERCOT) monthly average load data, which is the total electric demand on the Texas grid, will be used to generate a “Black Box” forecast. Those results will be compared to a regression model forecast. 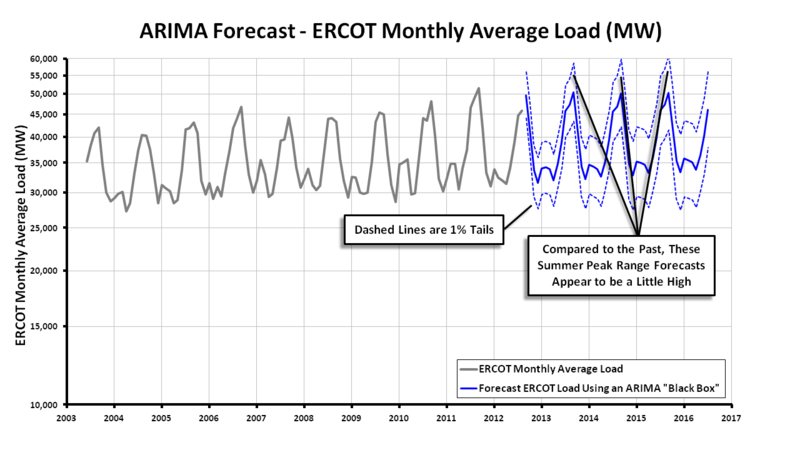 As shown in Graph 1 below, the gray time series is the ERCOT monthly average load from 2003 to 2012. It is a 31 day, end of month average, that exhibits seasonality and a long term trend. The solid blue line is a 48 month forecast, generated from standard ARIMA methods, allowing for a non-zero drift term. The dashed lines are the upper and lower 1% tails, such that the actual ERCOT load is not expected to exceed either tail more than 1% of the time. A common question about this graph is: Compared to the past, isn’t the forecast summer upper 1% range too high? The hot 2011 summer was at least a 1% event, yet the dashed 1% forecast line, if extended backward, appears to be well above that level. As you might expect, there isn’t an answer to that question that is acceptable to most people. The results are simply the results, and a long drawn out explanation of the ARIMA details doesn’t help. A better solution can sometimes be a model that is designed according to common sense, to be used for common sense. 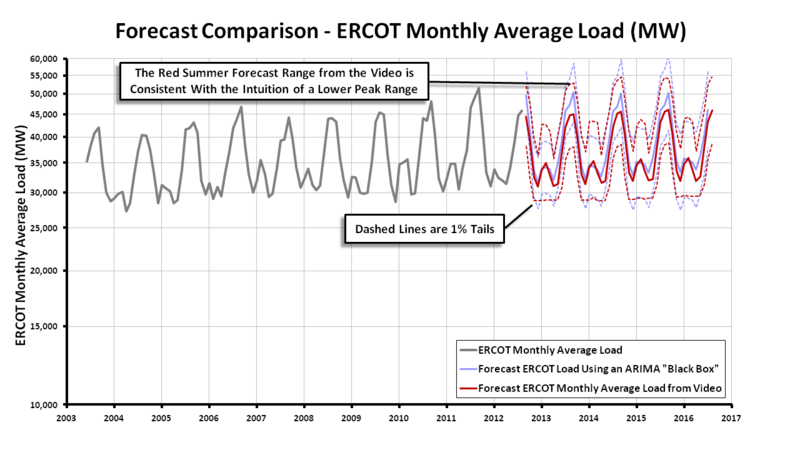 The following video describes a simple regression model relating temperature, and economic activity to ERCOT’s monthly average load. In Graph 2, the forecast in the video is compared with the original ARIMA forecast. It shows a significant difference in both the summer 1% bands, and the 2013 winter 1% bands. Which forecast do you believe, and why? Graph 2 – Comparison of the ARIMA forecast with the simple regression forecast that was discussed in the video. It turns out that the uncertainty in Texas temperatures determines most of the 1% spread, such that the faith in the video model is the direct result of the stability in the Texas climate. The bottom line? If the supporting data is available, it might be worthwhile to use it. The following is the R script that was used to fit and forecast the ARIMA model, and the regression model that was discussed in the video. # economic activity as inputs. library(DEoptim) #Used to determine the "Comfortable Temperature Zone"
#Forecast the data using the forecast() "black box"
#assumed temperature range for the "Comfortable Temperature Zone". #Extract the upper and lower temperatures for the "Comfortable Temperature Zone"
#scope and the two local variables are needed in modequ. #value from 1.0 and return it. #Fit the model, searching for the best "Comfortable Temperature Zone". #Using the results from DEoptim, define the "Comfortable Temperature Zone". TemSum <- outDEoptim$optim$bestmem #Temperature at top of "Comfortable Temperature Zone"
TemWin <- outDEoptim$optim$bestmem #Temperature at bottom of "Comfortable Temperature Zone"
onetai <- (1 - alpha)/2 #confidence value to be used with the quantile() function. #store the results so the upper and lower tails can be calculated. #Plot the forecast for the regression model.